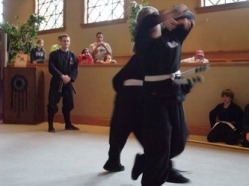 The techniques and information learned in the dojo are not to promote violence or fighting. Students are taught how to prevent fighting and escape danger when possible. Training times are on Fridays from 6:30 to 7:30 pm and Sundays from 4:00 to 5:00 pm.